Covina, California designer working in digital and traditional media. Includes portfolio, resume and biography. Specializes in logo design, branding, illustration, corporate advertising, web design and animation. West Covina. Provides civil and structural engineering services for new and existing structures. Located in West Covina, California. West Covina CPA firm providing tax planning and preparation, financial planning, and IRS audit services. Includes service-bureau newsletter, financial calculators, and tools. Vehicle-specific online shopping for TRD and Toyota parts. Full online catalog. Aesthetic medical center located in West Covina, California. Champion Arabian reining stallion. Contains an online video. In W. Covina. Dojo information, fees, photographs, links, terms, calendar and books. Contains troop information and activities, including a way to submit suggestions (online) for future outings. Katsuhiro Ozaki practices acupuncture in West Covina, California. Multilingual site. Teaching Ed Parkers system in Covina, California. Features techniques, events, interviews, news, links and realated school information. School in West Covina, California, USA. Includes instructors profile, style description, family tree and information about the school. Team news, program, schedules, calendar, meet results, gymnast of the month, biographies, fees and registration, proshop, staff. Hosts Gliders Invitational. Located in Covina. Offering crate and bait training. Kennel and breed histories, kennel goals, and the breed standard. Covina, California. covina attorney providing family law services. personal injury attorney based in west covina. Site includes contact information and worship schedule. west covina attorney focusing on personal injury, and workers compensation. west covina attorney practicing employment, construction, personal injury, business and commercial law. Local chapter in Covina. Includes news and events. court reporters in covina. staff biographies, on-line scheduling, contacts. Flamenco and ethnic dance studio in Covina, CA. Also a site of A Nuestro Aire flamenco dance company. West Covina, CA. School for kids and teens that provides training in stage, film, commercial and television acting with classes , philosophy, articles, and testimonials. La Sole Flamenco - Yvette Garcia is a flamenco dancer and instructor in Covina, California. Site contains the schedule of classes and performances, a resume, and links. SiteBook Covina City Portrait of Covina in California. 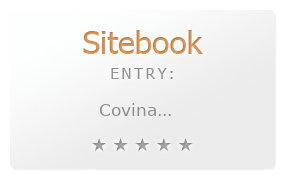 This Topic site Covina got a rating of 4 SiteBook.org Points according to the views of this profile site.